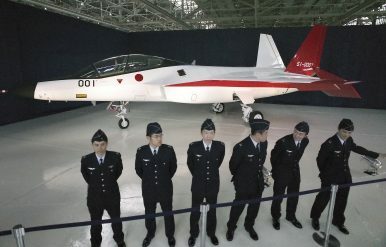 Japan’s new fighter jet will purportedly be based on existing European or U.S. aircraft designs. Japan is looking to cooperate with the United States and the United Kingdom in developing a new fifth-generation stealth fighter aircraft for the Japan Air Self Defense Force (JASDF), Reuters reports this week. A recently issued request for information (RFI), composed by the Ministry of Defense (MoD), has reportedly been sent out to European and U.S. defense companies with a more detailed document sent to the British and U.S. governments, according to sources familiar with the request. “Japan expects specific proposals for designs based on existing aircraft,” one of the sources told Reuters. The new RFI follows two previous RFIs that failed to attract any detailed proposals. It is unsurprising that the United States and United Kingdom are the alleged frontrunners in the upcoming aircraft tender. U.S. defense contractor Lockheed Martin has already purportedly supported the development of Mitsubishi Heavy Industries’ experimental fifth-generation fighter technology demonstrator X-2 “Shinshin” (formerly the ATD-X) in some capacity. The X-2 prototype was to serve as the basis for the F-3, Japan’s first indigenously designed stealth fighter jet. Additionally, the UK and Japan are already co-developing a Joint New Air-to-Air Missile (JNAAM) with a prototype expected to be built this year, and both countries agreed to explore options for jointly developing an fifth-generation stealth fighter jet in March 2017, as London is likely looking to replace its existing fleet of Eurofighter Typhoons within the next two decades. The reasons for the purported cancellation of the program are high R&D costs and the lack of viable and cost-effective domestic fifth-generation aircraft technologies for the X-2, including developing a next-generation aircraft engine featuring a 3D thrust vectoring capability. A collaborative new aircraft design, perhaps in partnership with Lockheed Martin, would most likely be based on the F-22 but larger. Japan wants its new multirole fighter jets to be capable of engaging in anti-surface war over long distances and consequently to be capable of carrying long-range, supersonic anti-ship missiles in an internal bay. Japan has a requirement for up to 100 new stealth fighter jets by the 2030s. The contract value for the JASDF’s latest fighter aircraft is estimated at over $40 billion.